936 JUP is a 14 cwt. Battery Electric Van built by Smith’s Delivery Vehicles of Team Valley, Gateshead. It was originally purchased by Newcastle General Hospital in 1954, for which it performed delivery duties around the hospital site for many years, including the rather macabre but essential task of transporting bodies to the mortuary. Smith’s is in the electric vehicle business to this day, and was formerly closely associated with Northern Coach Builders – who constructed the coachwork on both this van and on our Newcastle trolleybus 501 – and Ringtons Ltd, for whom they built many electric delivery vans. Mechanically, the van has a chassis in all-welded channel construction, ‘H’ section front axle with Timken hub bearings, and a double-reduction (helical / bevel) 2-star differential rear axle. Brakes are Lockheed hydraulic, with mechanical handbrake on the rear wheels. Steering is of the cam and roller type. Electrically, the van is fitted with a BTH 10.6 HP motor driving through a propeller shaft with Layrub couplings. The motor is controlled through a simple pedal-operated three-notch contactor / resistor panel and BTH hand-operated reverser / charger switch, which is electrically interlocked with the contactor supply circuit. The lead-acid traction batteries are in two 30 volt crated groups housed in panniers on either side of the chassis. The groups are wired in series giving a 60 volt traction supply, and a 12 volt tapping is taken off for lighting and auxiliaries. The batteries have a 13,000 ampere-hour capacity, giving an average range of 25-35 miles per charge, at a speed on the level of 15-17 mph. Consumption equates to approximately 20 kWh per full charge. 936 JUP was acquired by Beamish initially for general site duties. 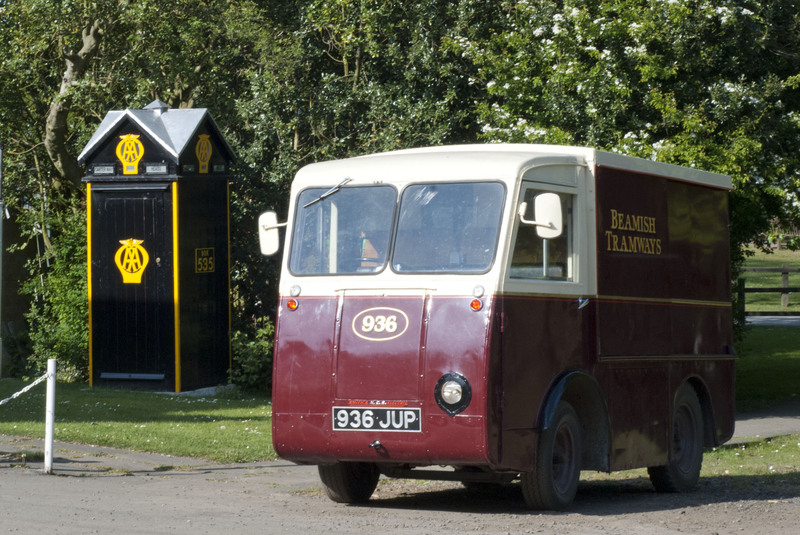 Following restoration by the Tramway Group, and numbered ‘936’ in the fleet, the van is used for operational and engineering duties around the tramway and museum site.